This past Friday, our family had the opportunity to take in the first race of the new Lucas Oil Raceway Stock Car Series. It was a chilly evening for late April, but that didn&apos;t keep us from having a great time at the track. Rain was threatening on the horizon, so they skipped the heat races and got right into the featured events. 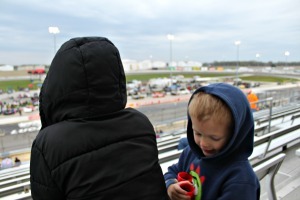 Each feature race was 20 or 30 laps long, which was perfect for my little boys attention spans! I love the oval track at Lucas Oil Raceway, because no matter where you sit, you have a view of the entire track. We didn&apos;t miss a second of the action. Things got even more exciting as the sun went down. Even if you&apos;re new to racing, there&apos;s something thrilling about seeing the cars try to maneuver and pass each other at each turn. My boys loved the action, and after one collision produced sparks, my 5-year-old exclaimed, "That was AWESOME!" My 4-year-old said his favorite part of the evening was, "All the race cars going so fast!" If you&apos;re looking for a fun family evening, I can&apos;t say enough good things about the Stock Car Series at Lucas Oil Raceway. It&apos;s an activity that everyone in our family truly enjoyed. The best part is tickets for adults are $15 and children under 12 and parking are free, so it makes for an affordable family night. I recommend bringing along seat cushions and binoculars. Seating is general admission, but there really isn&apos;t a bad place to sit. My kids also did fine without ear protection, but if your children are sensitive, you might want to bring earplugs. 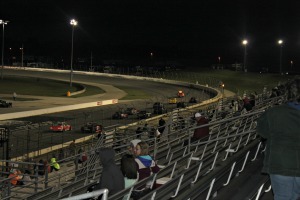 The next race in the Stock Car Series will be Friday, May 8 at Lucas Oil Raceway, followed by races on July 3 and July 31. The series concludes with a Sunday Championship event on Oct. 18. You can learn more about the series and get a promo code for discounted tickets to future races on the Visit Hendricks County website. Don&apos;t let spring and summer pass without a trip to Lucas Oil Raceway. We can&apos;t wait go back, and after you visit, I think you&apos;ll feel the same way!